Like the Afternoon Express Facebook page (if not done so previously); Reply to the Competition post on the Afternoon Express Facebook page (https://www.facebook.com/afternoonexpress/) during the Competition Period and tell us why “the VVIP tickets should be yours”; and Include #VPOWERHOTLAP on your entry. Competition closes: 19 October 2017 at 23:59 Terms and Conditions Apply. 1.1. 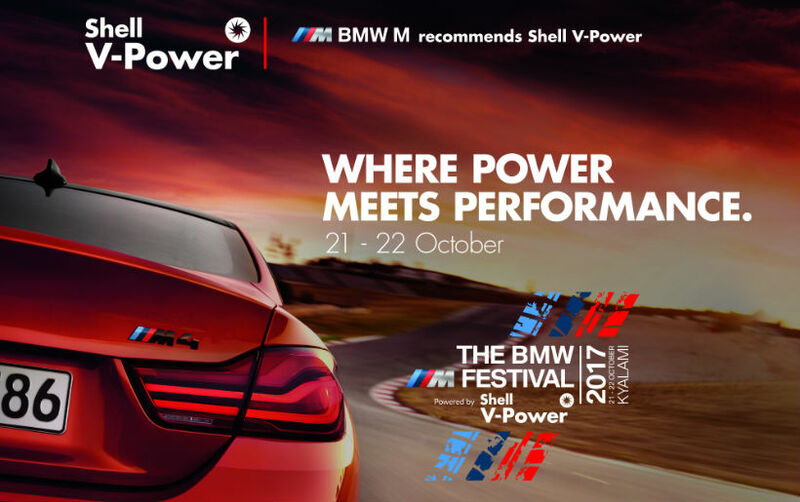 The Afternoon Express BMW M Festival Powered by Shell V-Power Competition (Competition) will be run by Cardova Trading (Pty) Ltd in association with Shell Downstream South Africa (Pty) Ltd (Organisers/we/us/our). Entries for the Competition will open at 13h00 on Wednesday, 18 October 2017 and will close at 23h59 on Thursday, 19 October 2017 (Competition Period). 4.1.3. Include #VPOWERHOTLAP on your entry. 4.3. You may inly enter once for the Competition. 5. How is the winner determined? 5.1. A panel of judges, who are appointed by us, will select 1 (one) person (Winner) from all valid entries as a winner of the prize herein within 24 (twelve) hours from the closing date of the Competition, subject to clauses 5.2 and 7.2. The Winner will be the entrant who is determined in the sole and unfettered discretion of the judges as the entrants who submitted the most entertaining entries. 5.2. We will notify the Winner by commenting on the Winner’s entry post within 2 (two) hours from determination of the Winner to request a copies of the Winner’s identification document in order to validate his/her entry and to request further contact details. The Winner will be required to provide an electronic copy of his/her identification document within 1 (one) day from being requested by us, failing which the Winner will forfeit the Prize and have no claim against us. 5.3. If a Winner does not reply to the notification message sent by us by within 1 (one) day from it being sent by us, the Winner will forfeit the Prize and will have no claim against us. In the event of a forfeiture as contemplated herein, we shall have the right to select a different entrant on the same conditions..
6.1.6. two vouchers for M Festival Merchandise to the value of R 250.00 (two hundred and fifty rand). 6.2. The Prize excludes all items and costs not specifically mentioned in clause 6.1 and is further subject to the terms and conditions for the Festival found at www.bmwmfestival.co.za. 6.3. We will contact the Winner to provide all necessary information for delivery of the Prize. 7.5. Where relevant, if a Winner does not accept the Prize as required herein, if an entry is not valid for whatever reason, if a Winner has breached these terms and conditions, if a Winner renounces the Prize we deem such Winner to have renounced the Prize, we reserve the right to declare the Prize forfeited and/or choose a new Winner. 7.9. Once the Winner accepts the Prize, the Winner accepts the Prize own risk. 7.10. We assume no liability whatsoever for any direct or indirect loss, harm or damage arising from your participation and/or any Prize awarded in the Competition or for any loss or damage, howsoever arising. All persons entering this Competition, indemnify and hold us harmless for any loss, damage, harm or injury (whether arising from negligence or otherwise) which may be sustained by him/her or any third party as a result of his/her participation in the Competition or using the Prize.